Growing old does not have to mean giving up on an active lifestyle. Pilates can keep the mature population active, but the instructors who work with them need to understand the limitations of their elderly clients. This workshop discusses the specific needs of the elderly population such as mobility, strength, endurance, balance and mindful stimulation. Many modifications and variations of the BASI Mat work will be taught in order to teach a safe and appropriate mat class that will meet the needs of the aging population. A one hour mat class with some of the variations taught in the workshop will be given to the participants. Early Bird registration tuition $200.00, regular tuition $250.00. 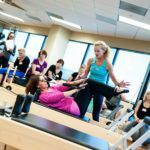 Register for both this workshop and the September 23, 2017 Pilates for the Mature Client workshop for $400.00 after discount. Contact BASI Academy for the combo rate. Local hotel Franciscan Inn is offering a special rate to workshop participants. To book a room at the special rate, please contact Eric at the Franciscan Inn between 7 am and 3 pm Mon-Friday at (805) 963-8845.